A polished concrete floor saves raw materials by transforming a structural element of your building, the concrete slab, into a finished floor. Traditionally, the slab was used as a sub floor, requiring the additional purchase and installation of carpet, tile, wood or stone. Leaving the concrete uncovered by subsequent layers of flooring maximizes its ability to absorb and retain heat. Also known as thermal mass, this ability to retain heat in the winter, yet also remain cool in the summer, can contribute to lower energy use for heating and cooling. When polished concrete floors are used with radiant heat, clean even heat is provided with lower water temperatures. This can be significant when considering the potential economic and environmental benefits of alternatives such as geo-thermal heating. The increased reflectivity of a highly polished concrete floor reduces the amount of lighting needed, especially in areas lacking natural light. This lowers electrical usage. Vermont Eco-Floors can be created with non-toxic stains and dyes and VOC free sealers, eliminating unhealthy off-gassing associated with other commonly used flooring materials. Polished concrete floors do not harbor dust and bacteria or support the growth of mold, and are easily cleaned with non-toxic neutral ph cleaners. The elimination of chemical stripping and rewaxing sometimes used in flooring maintenance improves your indoor air quality, while keeping harmful chemicals out of the waste stream. The geology of Vermont is fascinating and varied, and the use of native stone that does not have to be transported long distances adds to the unique beauty of your Vermont Eco-Floor. Polished stone creates a durable flooring surface, and durability is green! Investing in a floor that lasts will save replacement costs while keeping short-lived products out of our landfills. 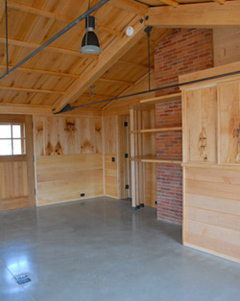 Vermont Eco-Floors is a member of the Vermont Green Building Network.